December 12, 2014 – Hi guys! Chef Brigitte Nguyen back with you today. I’m obsessed with trying everything in the Specially Selected line, as I have never been disappointed! Every product just seems a little extra special, gourmet and well-curated. Cooking with these ingredients makes homemade meals even easier and tastier, which is important this time of year for busy families. 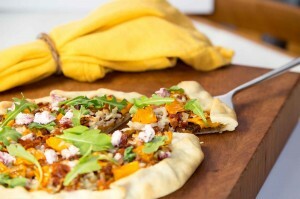 The Bacon Butternut Crostata I whipped up is something sweet, smoky and satisfying that the whole family will love. Kids love the sweetness of squash and the pizza-like quality of this crostata, which they can help assemble and customize to their liking. Specially Selected Center Cut Bacon is meatier than other bacons, so you’re left with plenty of bacon-y goodness and the perfect amount of rendered fat in which to caramelize the onions. I used two Specially Selected cheeses: mellow cranberry white cheddar to melt over the crust and tangy cranberry cinnamon goat cheese to stud the fresh, spicy arugula on top. This crostata is a perfect fall and winter meal or can even be served up in small wedges as a cocktail party appetizer. I love its rustic, free-form quality and I love using pie crust for something unexpected like this well-balanced, savory tart. Toss the butternut squash with the olive oil, salt, and pepper on a baking sheet. Roast for 14-16 minutes until squash is tender. Remove and set aside. In a large skillet over medium heat, cook the bacon until crispy and browned. Remove with a slotted spoon and set aside. Add the onion to the bacon grease (there should be about a tablespoon) and cook until soft, translucent, and beginning to caramelize, about 6-8 minutes. Add the water and the balsamic vinegar to the onions to help pull up the fond at the bottom of the pan and continue to cook until the liquid evaporates and onions are nicely caramelized. Allow to cool. To assemble, unroll the pie crust onto a parchment lined baking sheet. Spread the balsamic onions onto the crust, leaving a 1 inch border around the circumference. Sprinkle with half of the cranberry white cheddar cheese. Layer the butternut squash shingles over the cheese, then top with the bacon. Finish with the remaining cheddar cheese and fold the edges of the pie crust over, pleating to surround the filling. Bake for 15-17 minutes, until crust is golden brown and cheese has melted. To serve, top with baby arugula and the goat cheese crumbles. Photography provided by Jennifer Jackson at Third Life Photography. Where can I find Specially Selected Balsamic Glaze?? Both flavors. They are AWESONE!! I love Aldi’s Specially Selected cranberry white cheddar. I was recently diagnosed with type 2 diabetes, and am on a strict low-carb diet. The nutrition label on this cheese’s package says it has zero carbs. I don’t understand how that can be since cranberries do contain carbs.